Parker Ranch will celebrate their paniolo (Hawaiian cowboy) heritage at the 52nd Annual July 4th Rodeo and Horse Races on Friday, July 4 at the Parker Ranch Rodeo Arena in Waimea. While celebrating our nation’s independence, Parker Ranch paniolo, will be joined by other Big Island paniolo from area Ranches for a round-up of traditional rodeo events, including horse races, mugging, team roping and more. Fast paced rodeo action begins shortly after the 9 a.m. grand entry parade and continues non- stop until noon. The day starts with the traditional pomp and circumstance with the introduction the ranch teams and the grand entry. Under a beautiful blue summer sky, horse racing action kicks off a morning of excitement–the 1/4 mile, 1/8 mile, and relay races are always a thrill. In the midst of racing fever, skills and pride are on the line in traditional rodeo events taking place in the arena. Events such as the unique-to-Hawai‘i Po‘o Wai U, Ranch Mugging, Team Roping definitely show case the skills that have made Hawaiian paniolos famous throughout the world. The Parker Ranch July 4th rodeo provides an opportunity to see Hawaii’s cowboys in action while enjoying a variety of food from local food trucks and keiki (children) activities with the “kids favorites”–pony rides and a petting zoo. For those who enjoy having a memento, Parker Ranch commemorative logo items will be conveniently available at the arena at the Parker Ranch Store booth. Since 1989, Mauna Lani has received juvenile honu (Hawaiian Green Sea Turtles) from Oahu’s Sea Life Park, and has raised them in the saltwater ponds of the Mauna Lani Bay Hotel. The honu are cared for until they grow to a size and weight that are deemed appropriate for release into the wild. 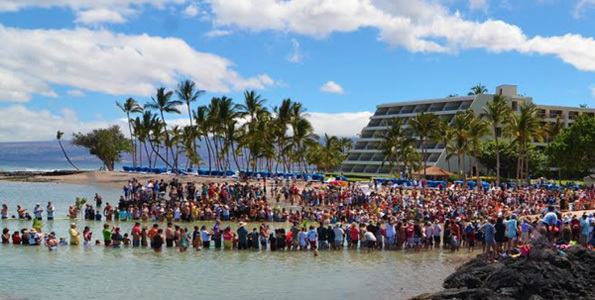 On Friday, July 4, 2014 the honu will be gathered at 10:30 a.m. from the Honu Ponds and they will be paraded to the beachfront for the release. A welcome ceremony will kick-off the event followed by the release. This annual celebration honors the honu and helps educate the public about the Hawaiian green sea turtle. Families are invited to join the celebration. Celebrate the Fourth of July at Kings’ Shops. There will be plenty of fun for the entire family at this year’s Rubber Duckie Event at Kings’ Shops. The fun starts at 11 a.m.
With a spectacular lineup of entertainment emceed by KAPA Radio Celebrity, “Jaz” Yglesias aka “Bolohead.” The race starts at 3 p.m. and will be called by Jaz and Comedic Magician, The Great Barusky. 11 a.m. Kahikina’s Nahenahe Ohana – Aunty Irma with adult students perform Hawaiian classics on `ukulele. 3:30 p.m. Dam STR8 – Father & Son duo with famed drummer Ronnie Atwater performing musical styles from contemporary Hawaiian to pop, classic rock and originals. Smooth harmonies as well as smoking guitars. In addition to the thrilling activities, food and game booths, there will be plenty of in-store promotions as well as gifts with purchase. Between June 29 and July 6 receive two HawaiianMiles for every dollar spent in Kings’ Shops. On the Fourth of July, spend $100 and receive a $10 Kings’ Shops gift certificate while supplies last. For more info or to adopt a duckie for the race, call 886-8811 or visit waikoloabeachresort.com. Hapuna Beach Prince Hotel turns up the heat with a special Independence Day Mango Edition Bacardi Pool Party featuring music by Super CW, DJ EeE, and DJ Compose, and special guest Konaz Surf Wear from 4-8 p.m. Enjoy refreshing Bacardi drink specials, VIP cabanas, prize giveaways, and more. For more information, visit HapunaBeachPrinceHotel.com/eve… or call 808-880-1111. Celebrate the 4th of July at Mauna Kea Beach Hotel’s North Point Lawn from 6 – 9 p.m. Indulge in a variety of all-American dishes including Roast Prime Rib, New Zealand Rack of Lamb, Cajun Shrimp, decadent desserts, and more. Music will be provided by Sonya. Dinner guests will also enjoy a fireworks show to top off the night. The cost for the dinner buffet is $85 for adults and $43 for children (ages 6 to 10 years), excluding tax and gratuity. More information can be found at MaunaKeaBeachHotel.com/events. For reservations, call 808-882-5810. Hawaii County Democrats will sponsor their 13th Annual July 4th Community Potluck Picnic from 2-4:30 p.m. Friday, July 4 at Kona Outdoor Circle Sadie Seymour Botanical Gardens in Kailua-Kona. The gathering is free and the community is invited to participate in this celebration of American Independence and the right and responsibility of voting in the rapidly approaching Aug. 9 statewide Primary Election. All Democratic candidates in local and statewide races have been invited and many of those in hotly contested races in the Primary Election — which will be just 5 weeks away — will be on hand to talk-story with guests and participate in a give-away of more than $1,000 worth of door prizes donated by the candidates. There is no charge to enjoy the picnic but everyone is asked to contribute a potluck item. Potluck items may be a salad, entree, dessert, platter of sushi, cheese or other finger foods, fruit or veggies, or even a watermelon. If bringing a prepared dish, the contributor is asked to make a card describing it and an appropriate serving utensil. Everyone is urged to use locally grown foods whenever possible to support local farms and ranches. As always, hot dogs and bottled water will be provided. Attendees may bring beach chairs, mats or blankets to enjoy picnicking in the garden area, though tables and chair will be available. Everyone also is asked to bring their own eating utensils to help make the event as “green” as possible by minimizing non-biodegradable trash. Parking at Kona Outdoor Circle’s Sadie Seymour Botanical Gardens is limited but some will be reserved for handicapped guests. Volunteers also will be on hand to direct parking, including use of a shuttle to nearby parking. The picnic will conclude at 4:30 p.m. and attendees are then invited to join the Hawaii County Democrats marching in the Annual Kailua-Kona Independence Day Parade, which this year begins at 6 p.m. and culminates with fireworks at 8 p.m.
For further information or to volunteer, contact Barbara Dalton, 333-0484, or email barbiedalt@gmail.com. Or contact DPH Dist. 5 Chair Steve Sakala (sustainablesakala@gmail.com), District 6 Chair Ron Gillespie (rdgille@hawaii.rr.com), or District 7 Chair Patti Cook (cookshi@aol.com). This year’s theme is ‘United as One’ and the grand marshal is the Hawaii National Guard. Fireworks over Kailua Bay at 8 p.m. In observance of the Independence Day 2014 Holiday, all public libraries will be closed from Friday, July 4 through Sunday, July 6. However, Kealakekua Public Library will be open Thursday, July 3. Visit the HSPLS website: www.librarieshawaii.org or call your local library for public service hours. Fireworks are prohibited in national parks, including the Fourth of July, according to federal law. Visitors will notice ‘Fireworks Prohibited’ signs posted near the entrance to Hawaii Volcanoes National Park, and are reminded that fireworks are not permitted in any national park.